E-Cell NIT Trichy is a student run non-profit organisation that aims to fire the entrepreneurial dreams of young technical minds across the globe. We do this by organising Workshops, Guest lectures, Google hangouts, Ventura - International Business Plan competition, Case Study competition, Start-Up Internship Program, Entrepreneurship Summit and Investment Bootcamp among others. E-Cell also has tie-ups with Leading Venture Capitalists and Angel Investors across the nation. 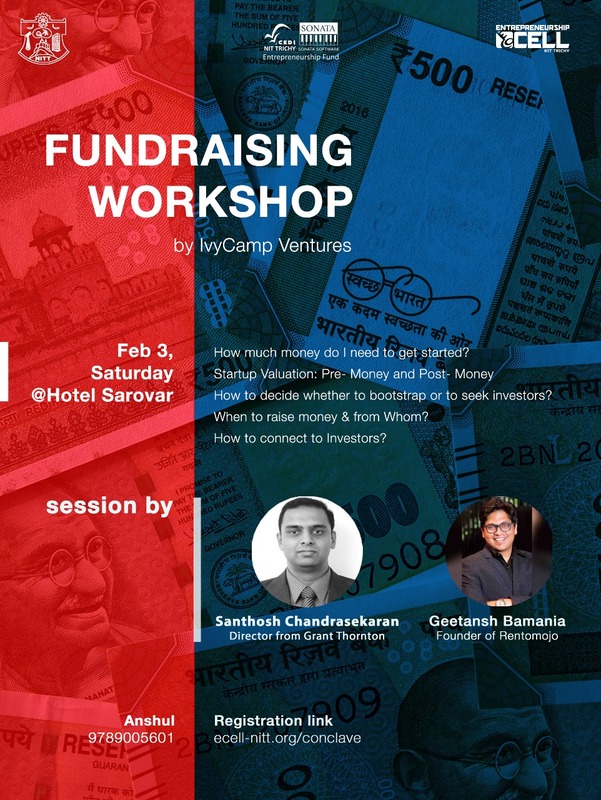 The afternoon session will consist of a workshop on Fundraising organized by Ivy camp . This session will help promote learning among early stage entrepreneurs and will be a wonderful learning experience. They will get to interact with well -versed speakers who will add enhance their knowledge.